← New The Breakdown Episode: Are Financial Institutions Holding Our Economy Hostage? Testimony Concerning Assembly Bill 935, the California Foreclosure Fee. Today, April 25th, California’s Assembly Committee on Banking and Finance will consider Assembly Bill 935. This is a common-sense response to the costs being imposed by the foreclosure crisis on municipalities and communities. AB 935 requires a foreclosing bank to pay a $20,000 fee to mitigate the cost on local government. Here is an editorial in the Sun by Ellen Reese and Jan Breidenbach, Banks should pay foreclosure costs, that outlines the bill and the argument. I was invited by the excellent people at the Alliance of Californians for Community Empowerment and SEIU to testify on this bill. Below is what I intend on saying this afternoon in Sacramento. Regular readers will recognize the arguments, though the opening story is a fun one if you are unfamiliar with it. Hello, my name is Michael Konczal, and I’m a research fellow covering financial reform, the economy and the foreclosure crisis with the Roosevelt Institute, a non-profit think tank. I want to start my testimony with a short story. In 2007, there was a West Nile virus outbreak in the Bakersfield area of Kern County, California. This was unanticipated by experts, as the weather was dry and hot in that area. Since the logical place where the mosquitoes would come from, the Kern River, was mostly dry, researchers couldn’t find where the mosquitoes were breeding at first. Foreclosure are a lose-lose-lose situation. They cost investors, they cost homeowners and they cost communities. A successful modification can make this a win-win situation where everyone benefit. But successful modifications require time, work and energy from banks — it’s just like creating a new mortgage — so this foreclosure fee incentivizes banks to put in that energy. Many foreclosure are going to happen. They are still going to cost communities, so a fee is still appropriate. But at the margin, there are some homeowners with whom the bank could take the time and energy to re-negotiate a mortgage. Normally they won’t, and instead they’ll let the community and investors eat the costs. These are big costs: $60,000 to investors in good times, far worse in these bad times. This fee will “nudge” the bank to put in the energy necessary to help with modifications. There’s good empirical evidence that the fewer of these incentives, the better chance of a good modification. The servicers are making a financial calculation. Putting this $20,000 mortgage mitigation fee as an added cost on the side of the foreclosure option will tip the scale towards modification. Dodd-Frank and other national and international financial reform efforts are hard at work trying to fix these problems. But they won’t help the current crisis in California. There is concern that this fee will be passed straight to consumers. Economic theory tells us to not worry about this. First, the financial sector is back to record profits, with major bonuses and a 40% share of total profits for all businesses. The largest banks have a huge profit margin. It’s in a situation like this — where a producer has a huge profit margin and consumers are price sensitive — that textbook economics tells us it is very difficult for a fee to be passed along. Firms will absorb far more of the costs rather than lose customers, especially to competing firms. And since this only impacts old loans and it is set to sunset, there’s no reason for it to affect the price of new loans at all. The only way this could even potentially get passed on to consumers is if it raises costs (1) for all lenders, not just the ones that made bad loans and (2) for new loans going forward. Since that is not the case, the market and competition will prevent the fee from being passed on. The profits of the financial sector have returned to pre-crisis levels. The rebound is not an accident, nor is it the result of ingenuity. The government has made a concerted effort to bail out and protect banks and turn a blind eye to limiting the damages foreclosures are wreaking on the larger economy and our specific communities. Homeowners are trying to do the right thing. There’s no evidence of large numbers of strategic defaulters that stands up to scrutiny. The Federal Reserve actually wrote, “The fact that many borrowers continue paying a substantial premium over market rents to keep their homes challenges traditional models of hyper-informed borrowers,” which is a way of saying that homeowners aren’t walking away from their mortgages and are willing to pay to do right by their communities and their promises. It would be great to have a financial system that met them halfway. 1. See “Delinquent Mortgages, Neglected Swimming Pools, and West Nile Virus, California” William K. Reisen, Richard M. Takahashi, Brian D. Carroll, and Rob Quiring. 2. 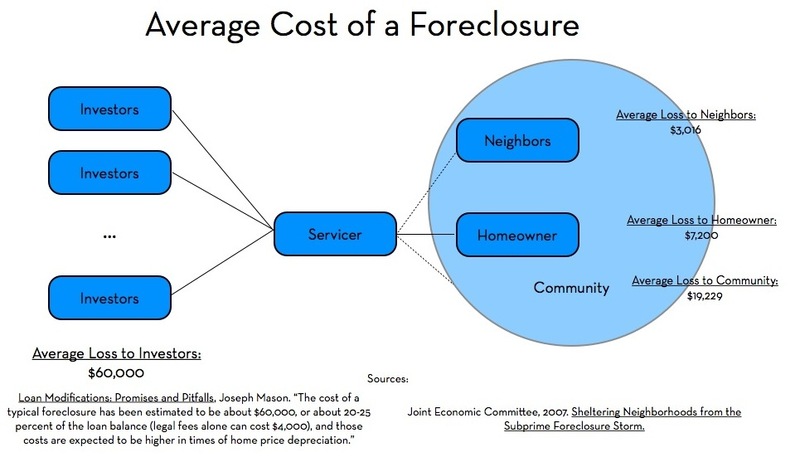 For more on the cost of a foreclosure, see “The Impacts of Foreclosures on Families and Communities: A Primer,” Urban Institute. May, 2009. “Sheltering Neighborhoods from the Subprime Foreclosure Storm,” Joint Economic Committee. 2007. “Mortgage Loan Modification: Promises and Pitfalls,” Joseph Mason. October 2007. 3. On conflicts between servicers and investors, “Why Servicers Foreclose When They Should Modify and Other Puzzles of Servicer Behavior,” National Consumer Law Center. November 2009. “Market-Based Loss Mitigation Practices for Troubled Mortgages Following the Financial Crisis“ Sumit Agarwal, Gene Amromin, Itzhak Ben-David, Souphala Chomsisengphet and Douglas Evanoff. October 2010. 4. Some estimates are from “The Market for Single-Family Homes in the Boston Area,” Karl E. Case. 1986. “The Demand for Housing” Maisel, Burnham, and Austin, 1971. “An empirical reconciliation of micro and group estimates of the demand for housing,” Polinsky A. M. and Ellwood D.T. 1979. 10 Responses to Testimony Concerning Assembly Bill 935, the California Foreclosure Fee. Like the clever hook of West Nile. More advocates should pay that type of attention to emotionally conditioning the audience for acceptance before getting into dry facts about externalities. Do you have any other evidence besides the federal reserve that home owners are walking away from mortgages? 30% of foreclosures have been living rent free for two years or more. This bill would add another 20 grand worth of reasons to stop paying. Especially in CA where the houses are more expense and harder to resell. This is a 42-page document, and I’m lazy but interested. Could you direct me to where the 30 percent stat is? OK, so it seems that it’s on p. 31. The problem is, the graph doesn’t say what you claim it does. The title is “loans in foreclosure” and the y axis is “inventory.” On page 35, LPS defines “foreclosure inventory” as “the servicer has referred the loan to an attorney for foreclosure. Loans remain in foreclosure inventory from referral to sale.” LPS has a separate definition for “foreclosure starts,” which is “any active loan that was not in foreclosure in the prior month that moves into foreclosure inventory in the current month.” Thus the 24-mo. bucket is a cumulative measure that includes loans that were foreclosed upon before 24 months had passed. I don’t know about this, Mike. Your assumption seems to be that discouraging foreclosures will lead to modifications. This is labor-intensive work that needs skilled, experienced staff, which the servicers don’t have due to their prior negligence. I anticipate a lot of potential for unintended consequences, although I haven’t thought through what the other outcomes might be. Something just occurred to me: Why aren’t there more short sales? People have been discussing the irrationality of not doing more modifications, but they haven’t been saying a lot about this question. Modifications are risky because the borrower can always re-default, leaving the investor worse off. Short sales, however, are cash in hand. Granted, there are hardly any buyers right now, but you would think that there’d be enough if prices went low enough–and they could go pretty low, considering that foreclosures typically generate huge losses. (I’ve heard anywhere from 30 to 70 percent.) Short sales presumably wouldn’t have the same skilled labor constraints as modifications.